This is something I actually did over a year ago (October 2016), but I just now realized that I never wrote a blog post about it, or posted the pictures anywhere—which is awkward now that I wanted to email someone a link to the pictures. I've never in my life made an article of clothing, except I once knitted a Dr. Who scarf that was about 15 feet long, and I think they made us knit gloves in grade school. (Yes, gloves, it was hard, but this was a Steiner School in Switzerland and they take their crafts seriously. We also made candles and learned to carve wood.) Anyway, prompted by Chantelle, a friend of Nina's, I decided to see if I could make something wearable using the giant quilting robot. I decided on a skirt on the grounds that it is the simplest possible article of clothing. Shirts and pants are way too hard, but a skirt is basically just a tube (plus a zipper or elastic depending on the shape of the person you're putting it on). Also, skirts can be twirled, which makes them fun. The pleating is enforced by a combination of strongly ironing the outside pleats, and using a serger to sew a fold into the inside pleats. That combination seems to keep it pretty reliably shaped the way it should be. The Ulam Spiral Quilt has finished stitching, and it looks pretty cool, in an abstract-yet-meaningful way. On an unrelated note, I tried folding up the Infinite Pi quilt for the first time and was delighted to discover that it folds most naturally into a slice of pie! Here it is folded on top of the Ulam Spiral. Nina suggested representing each prime number by an in-and-out spiral, which looks cool, and should lay down enough thread to make the primes stand out. This pattern should stitch quite fast, because it's got a lot of straight lines in it. I made two designs, low density (primes up to 1225) and high density (primes up to 9801). I am, of course, doing the high-density one first. Here is the low density version, where you can see the individual spirals. And here is the high density version I'm actually going to stitch. The lines will be about an inch apart. I'll start it later this afternoon (Saturday May 7th, 2016 for you people reading this years from now). If you want to be notified when stitching actually starts, sign up for the StitchCam email list at the StitchCam page. I'll post again when it's done and I have pictures of it. Yesterday I started making an infinity-pi quilt, thinking it would take several days to finish. Thanks to my stupidly looking at the stitchcam at 2AM and thus being forced to go into the office to stop it from running forever without bobbin thread, it actually got done early this morning. Total stitching time was around 12-15 hours. I am extremely pleased with the result, and have decided to make the quilt available for sale. Due to the stitching time, and the use of expensive wool batting, this quilt costs 200π ($628.30), twice the price of the older, lower-density pi quilt. The design is one single continuous line of approximately 420,000 two-millimeter stitches. You can watch the machine making this quilt in these time-lapse views from the stitchcam (one from the overhead view, one from the camera mounted on the stitching head). I tried several different functions to determine the rate at which the digits get smaller as they go around the circle. The obvious choice would have been to have it be as if they were on the surface of a sphere, but this ends up with too wide of transition zone between reasonable-size and too-small digits. What worked best in the end was simply a sine wave. It's as if you are looking over the "horizon" of the sine wave. At first the sine rises with a fairly constant slope (digits all the same size for quite a while, getting smaller only rather slowly). Then quite quickly the curve turns over and starts to get flat (so the digits get small very quickly, going from easily readable to one-stitch-high in just three revolutions around the circle). Within the resolution of the 2mm stitches, everything is smooth and continuous: The digits just get smaller and smaller until eventually they are nothing but abstract squiggles, and finally a smooth circle of infinitesimally small digits. Needless to say, this pattern is 100% computer-generated. The only human contribution was to select the font, and write the code for kerning, spiraling, shrinking function, etc. Basically art-directing the algorithm to produce a pleasing end result. Pi digits courtesy of Mathematica. We've only made one so far, with dark blue thread on unbleached cotton fabric. I think it would look good with gold on black, but Nina is voting for unbleached on unbleached (which looks really good in our lower-density pi quilt). If someone orders one, we'll also make a square design with the corners filled in with some kind of simple fill pattern. An added bonus of the round design is that it folds into a slice of pi! I'm trying a new, slightly insane quilt: A version of our best-selling Pi Quilt, except with an infinite number of digits. Well, technically, we won't actually stitch all the digits, because once they get smaller than a single stitch around the outside, you couldn't actually see them anyway. But you can imagine they are all there. I'm hoping that somewhere in the vicinity of five or ten thousand digits will actually be visible. (The file technically contains about 15,000 digits, but I suspect they will start to break down well before the end.) How will I know how many are actually visible? Easy! I'll look for the smallest visible ones, and then determine the very last ten or so digits that I can actually make out. Then I'll do a search in the sequence of digits to find at what position those ten digits occur (which will almost certainly be unique in the first billion or more digits). The quilt is starting now: If you see this any time in the range of May 3rd to 5th, you can probably see it running on the stitchcam. PaleGray Labs (which is the textile collaboration of Theodore Gray and Nina Paley) will be hosting an open studio and show of hand-made and robot-stitched quilts at the 2016 Boneyard Arts Festival in Urbana, Illinois on April 8-9. Come to our studio in downtown Urbana to see quilts and the machines that make them! Come see Behemoth the giant quilting robot! See the Quilt Cave, set up for this show only! With better lighting than in this terrible photo! Enter the Quilt Vault and see the treasures within! Hand made quilts of stunning beauty, safe in the Quilt Vault. On exhibit along with the room-sized Behemoth will be our embroidery machine, sailmaking machine, and several foot-powered antique sewing machines, along with dozens of quilts. All the machines will be in operation making quilts and embroidered things throughout the show. Our studio is located in the former bank building now known as County Plaza, which is across Main Street to the north of the County Courthouse, just north of Lincoln Square mall. Officially the address is 102 E. Main Street, Urbana, but actually you want to go around to the North side of the building on Water Street, then walk down the ramp towards the parking structure and enter the north door of the building. As part of the Boneyard Arts Festival in Urbana, Illinois, we are having an open studio and quilt show at our office! Click here for details of times and location. William, the dealer from whom we got our giant quilting robot, sent us a video a few months ago of a new technique he'd invented: Stuffing thick yarn through the center hole of the hopping foot and letting the machine stitch it down to the quilt. This works amazingly well, though with some limitations (no breaks in the pattern, and no sharp corners). I'm not sure what we'll use the technique for, if anything, but it's really fun that it works at all. I did four experiments. The first one, the Pi quilt pattern, was a failure. Almost tore the fabric. Then I made a test pattern with only smooth, gentle curves and no breaks. That worked great. All the yarn I tried was super-think, because I feel that it has to be thick or the needle is likely to miss it. There is nothing holding the yarn in the proper position other than the fact that it's as big around as the hole in the foot, so it can't really get out of the way of the needle. A real couching head would ensure correct placement of the yarn and thread, but it would also cost money, and doesn't currently exist for this machine. This technique, on the other hand, costs nothing (though I might decide to bend up a wire coat hanger to make a guide for the yarn). Nina and I have been working forever on a project to create a short animation where every frame is rendered in embroidery. It's finally finished and ready for the world! You can read Nina's Blog post about it, or watch it here. Every frame in the video is simply a photograph of an object that exists in the real world (in fact, you can buy them). There is no Photoshop manipulation. All the close-up animation of the figures is photos of the 6-frame sheets as you see at the start of the film. The song is something to do with passover. Sorry, not my thing, so I can't tell you much about what it all means (see Nina's blog). All I know is that it's a folk song, kind of like the spider-that-ate-the-fly song, and that it's sung in Hebrew and Aramaic (which sounds as ancient as it is). There's a good bit of technology that went into creating the stitched animation. I've given several talks about it, but never posted about it online, because we were waiting until the film was done. There are two reasons it's not easy to make this kind of animation (other than that it's not easy to get started on something so obviously more work than it's worth). First, embroidery machines only go so fast, and even a small bit of animation requires a lot of frames (this film has 516 individually stitched images running at 12 frames per second, with some looping and repetition). It just takes time to do that much stitching (about a month in this case). The second problem is that the software available for creating embroidery designs is not up to the job. It's stuck, both conceptually and stylistically, somewhere in the late 1980's. In particular, it is utterly impervious to attempts at automation. Automation is crucial in animation, both because of the scale of the problem, and because if you want consistency from frame to frame, you want to avoid manual steps that introduce variability. So we created all the embroidery designs using custom software we wrote specifically for animation embroidery, which allowed us to control the exact placement of stitches, not one frame at a time, but over all the frames as a whole. Here's what it looks like when imported into Mathematica (my tool of choice). This is Mathematica's beautiful rendering of its Region objects, which allows you to see that we've preserved the full polygons for each moving part of the figure. We start with the unclipped polygons because they are used to determine the direction of stitches (always perpendicular to the major axis of the polygon). Because, in Nina's style of animation, the polygons don't change shape, this means the stitch direction will follow the movement of the figure, making the final animation look like a single stitched figure is moving, rather than a hodgepodge of separate figures. You can see all the zig-zig stitches (called satin stitching), but notice that there are also some lines haphazardly crossing the middles of patchs? Those are traveling lines that let the machine get from one patch of color to another of the same color, without having to stop and cut the thread. This is crucial to maintaining fast, efficient stitching. You don't see them in the final result because they are always underneath later satin stitching. This turns into an optimization problem: Figure out which colors to do in what order, to minimize total thread cutting. For example, these were the first two steps in making the above figure: Notice how the traveling lines will all get covered later. Our code optimizes this automatically. Here is the stitched result. Notice how stitch direction makes the different parts of the leg clearly stand out from the body, and from each other, even though they are exactly the same color. The interplay of light and thread is a delightful aspect of this style of animation! Even just filling a patch is far from trivial. You can't just start at one end and stitch to the other, because you might stitch yourself into a corner. Imagine a painter who is painting the floor of a house with a complicated set of connecting, branching hallways. If you start painting down one dead-end hallway, you'll paint yourself into a corner and not be able to get out to finish the rest of them. Instead you have to walk to the end of each side-branch and paint backwards, until you reach a branching point, then walk down the next branch, etc. Filling with stitches is just like that, except you're only allowed to move the brush in one direction, which further complicates the issue. Here is a little animation I made testing the code we wrote for solving this problem (which turns out to be largely one of graph theory). The lines are "walking stitches" used to get to the ends of the "hallways" and the filled patches are the satin stitches that will cover them up. It took a while to get all this code right, but of course it's crucial that it cover every possible case, because when you're doing animation, it's not about getting one frame right, it's about having an automated process that always gets every frame right, not just once, but every time there is an iteration of the animation requiring a re-render of the frames. We must have generated tens of thousands of frames (just generated the files, not actually stitched them!) before it was all looking good. You can see the finished animation at the top of this blog post, and below is a version that is just a run through of all 516 frames (with just a bit of looping, but no cut-aways), in case you want to concentrate on watching the stitches. After my last blog post about molecule quilts for sale, a rush of orders and enquiries came in. One person asked whether it would be possible to make a quilt of cyclosporine (a drug used to help prevent rejection of transplanted organs). The first structure I found for the molecule looked like the picture on the right. Not a terrible molecule, but see the abnormally long bond line on the bottom left? That's a symptom of poor layout of the atoms, which obscures a very interesting fact about this substance: It's a big ring! It's a very unusual cyclic peptide (short protein) made by a fungus. I looked around for a nicer version, and found this lovely rendering, which makes the cyclic nature of the molecule very obvious! Unfortunately it's not ideal as a starting point for a quilt, because all that empty space in the middle is wasted, meaning the individual atoms would be too small. So I took this starting point and rotated the longest of the protein side chains by 180 degrees so they point inwards, resulting in the design you see at the top of the article. By the way, if you're wondering why I can just bend things around willy nilly without making the structure wrong in some sense, it's because this sort of 2D structure diagram is never really a true representation of the actual shape of the molecule. The uglier structure is in a sense more accurate in that it shows more bond angles closer to what they really are, but both are full of compromises. In any case the real molecule is 3D, not 2D. Here is what it actually looks like (from Wikipedia). Notice how lots of things are on top of each other: The only way to flatten this mess into a clear 2D diagram is to bend and shift it around in quite arbitrary ways. The cyclic structure is the one that most clearly illustrates the logical layout and connectivity of the molecule, which is what these diagrams (and quilts) are meant to do. Molecule Quilts Now for Sale! After several months in stealth mode, I've decided that in honor of C&EN (Chemical and Engineering News) doing an article about them, I should really start selling molecule quilts. The basic idea here is that I've written Mathematica code to automatically create a quilting pattern from any MOL file. (Actually I did that last year, but am only now getting around to commercializing the idea.) I've come up with some dumb and/or funny ideas for molecules you could put on a quilt, but really I can do any sensible molecule just as easily: The code is entirely automated. I have a page that tells you everything you need to know about molecule quilts, and their very reasonable pricing. Open Studio and Quilt Show on Right Now! New Custom Word Quilts For Sale Now! Have a clever Idea? Get a special deal! For the last month or two we've been experimental with word-quilts like you see here. I've got reasonably robust Mathematica code to automatically construct a stitching pattern for any set of words, and Nina has found a pleasingly simple combination of font and background pattern to focus attention on the words. So we're ready to see if anyone will buy one....Eventually our intention is to have certain stock designs available at fixed prices, and custom wording available for a higher price. But we need more ideas for clever things to quilt into words, and we've got a quilt show coming up where it would be fun to have some more word-quilts. So for the next week (April 1-7) if you place an order below for either size of word quilt (Queen or Twin) you'll get a field where you can fill in any words you like for the same price as the stock items will be. The only caveat is that, if you think of something particularly clever, you have to let us keep the quilt until Arpil 12th when the show is over so we can exhibit it. And if you have to agree to let us use your clever saying as a future stock quilt item. So, what will it be? Cheesy saying? Deeply meaningful sentiment? Happy Birthday Quilter-Bob? If you can write it, we can quilt it (including Chinese and Japanese characters, by the way). After you send in your order, we'll get back to you with a proposed specific design (feel free to suggest line breaks and what to emphasize, or email me at theodore@theodoregray.com in advance if you want to discuss what would look best). So far the only things I've thought of are silly phrases, but Nina contributed the lovely opening lines of On Children by Kahlil Gibran. Then again, she also contributed the one below. Here's what one looks like on a bed. With lots of small letters they can be quite thin, but with a small number of large letters, they are thick and puffy (we use 20-oz batting with approximately 1.25" loft). We can make a quilt out of any set of words you like! We'll even do naughty words, if that's what you want. When you place your order you'll have a chance to specify which words specifically you want. Keep in mind that the fewer words there are, the better they will look: 10-30 words maximum is a good target. "Happy Birthday Bob"? The sky's the limit on quilted word cleverness. Include special requests for fabric color or layout in the form you will get on checkout and we'll get back to you if there's any trouble with your choices. Order here! The order system doesn't say anything about selecting the fabric or thread color, because we have opinions about what looks best, and what we can produce most efficiently. However.... If you also have opinions, and particularly if you are ordering a Queen size quilt (which does not need to be combined with a second one on a single piece of fabric), feel free to email me or include requests for custom colors in the order form. We can't promise anything, but will consult you on the options and happily return your money if we can't come to an agreement on what to make. Same goes if you have opinions on the font to use. In principle our code can generating the letters in any font available in any computer-compatible format (i.e. anything I can get for a Macintosh), but some look much better than others, for reasons that are not always related to how good the fonts look in print. If you'd like to suggest a specific alternate font, please feel free, and if it seems plausible, we'll send you what the generated design looks like and you can decide whether to have it stitched up. But back to the subject of pi day: Needless to say, I made a quilt for it! Actually I had been paying no attention to pi day until yesterday when I heard the first people talking about it, but it just so happened that I had worked out a design for this quilt on a flight home from London a couple weeks ago, for no particular reason. Luck favors the prepared, eh? And guess what! If you like it, you can buy it (or one exactly like it)! Yes, now that we have experience with volume production, we are all about actually selling quilts, stitched by our fabulous robotic quilting machine that just loves to churn these things out. Order below, don't delay, you know you want one! A fabulously nerdy quilt for an irrationally low price: $133.13 (the fourth root of pi) for a 46" square version and $314.15 for the full Queen size (94" square)! This beautiful, warm, puffy quilt displays over a hundred digits of pi rendered entirely in stitches for a gorgeous sculptural look. 100% cotton top and back fabric with 100% polyester batting. There is a choice of fabric and thread colors, but we strongly recommend unbleached cotton with natural unbleached thread. This allows the texture to really stand out. 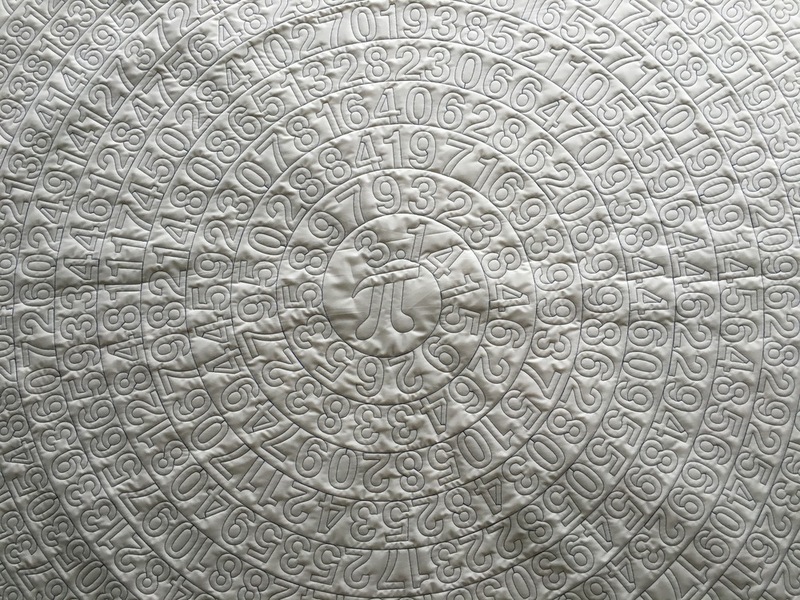 If you want even more pi, we also have a remarkable circular quilt that contains all the digits of pi. Seriously. Periodic Table Quilt Backlog Cleared! Left over is a mountain of trimmings! There's always about 4" of excess fabric and batting around the outside where the sandwich is held in the frame clamps. It gets recycled into pillow stuffing and fabric scraps for various purposes. But right now it's still blocking the view out of our inner office window. It was fun being a textile manufacturer for a week. The challenges are different than being an author or designer, but no less interesting or worthy of attack. If we have continued success with this and other quilt designs, I can see many opportunities for streamlining the process, and no reason why we couldn't operate a profitable textiles business here in the midwest. Periodic Table Quilts for Sale! Cross-post from my regular blog, check there for details, but the short answer is that periodic table quilts are now for sale, sort of. UPDATE! These quilts are now for sale! For this reason I chose Bodoni 72 for the element symbols and titles, except for variations with background lines. It turns out to work much better to use a thin font (Nobel-Light in the following example) to get maximum separation between letters and the space between them. I've just started making a black-background one, and it's looking nice! A brief note on technology. The design was, of course, done with Mathematica. (Lord knows how else you could do it, I certainly wouldn't want to try!) The letter forms were acquired using a trick that lets you export text in any font to EPS with all the letters converted into polygons, then re-import the EPS and extract from it those polygons. (This is one line of Mathematica code.) Further code measures the resulting outlines and fits them into the space available for each component of each element tile. The meat of the code is the part that recursively links up parts of each tile at their points of closest approach, resulting in one line for each element. The periodic table as a whole is then linked up with attention paid to the order of stitching to minimize warping and placement errors in the final result. Once I have a few of these finished in different colors and have set up a shop for people to buy them, I'll tell the people over on my other blog about them, but for now I think it's too much stitch-nerdery for that group! Over on my science-type blog I posted a video what what quilting looks like to a thermal imaging camera. You want to see that. I don't know how to post things to both my blogs at the same time, so just going to put in a dummy post here that points to my most recent post over on my other blog.